Jane and I biked to Rocky Mountain Arsenal Wildlife Refuge the previous Saturday and hiked around the two lakes. I learned that both lakes were catch and release fishing only with single flies or lures and barbless hooks. The lakes are open for fishing only Tuesday, Saturday and Sunday from 6AM to 6PM and require a $3 daily fishing permit. On this warm Sunday afternoon I decided to give it a shot with my new six weight rod I’d purchased for Alaska. When I departed there were some dark clouds building to the west, but the storms apparently went a different direction, because I never experienced rain. 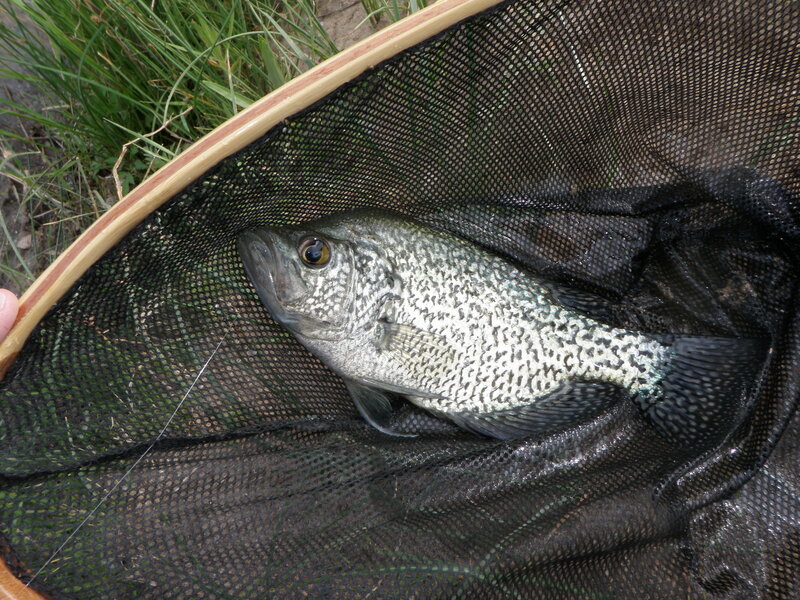 When Jane and I hiked around the lakes, I’d observed several spots where there were a cluster of panfish, and I’d also spotted three bass of decent size, so I elected to return to Lake Mary where I’d observed fish. The first fly I tied on was a damsel fly nymph with a single split shot. In short order this fly produced a small bass and then the first crappie bass. I was off to a good start, but then I hooked the damsel fly in a tree on a backcast, and it was too high to remove, so I ripped it off. I couldn’t find another damsel nymph in my fleece pouch, so I tied on an olive/black woolly bugger. This didn’t produce, but as I was casting and stripping, I noticed a group of fish moving in a school and sipping something from the surface. I tied on a Chernobyl ant hoping to entice some surface action. I moved to a large wooden platform on the northwest side of the lake and cast the ant back toward the shore east of the platform. I started getting rises and hits to the Chernobyl, but apparently it was too large to get in their mouths. I managed to land one small sunfish. When the school of fish came by, I cast the Chernobyl in their midst, but apparently they were tuned into something different. 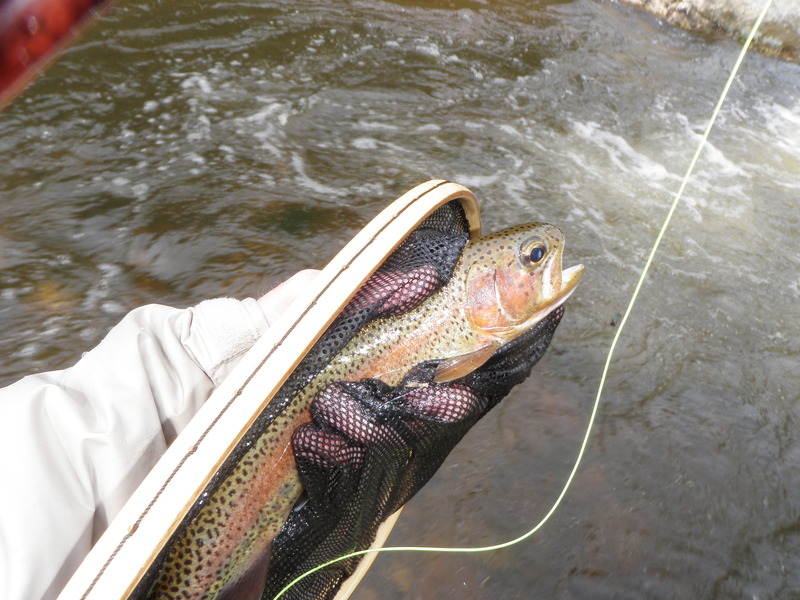 I returned my focus to the fish near shore and swapped out the Chernobyl ant for a deer hair caddis dry fly. 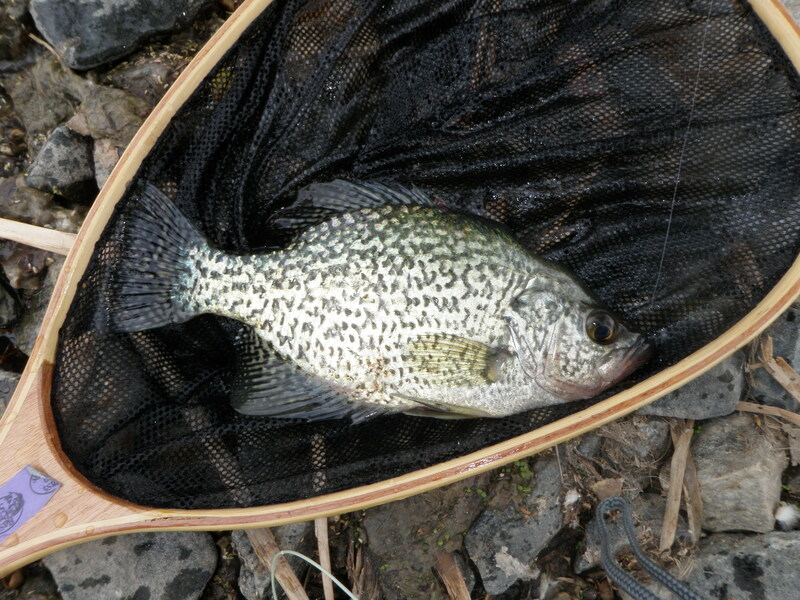 I landed two more small panfish on the caddis; one was a sunfish and the other a slightly larger bluegill. Next I decided to go back to subsurface fishing, so I tied on a beadhead emerald caddis pupa with a split shot. I was tempted to try a dry/dropper configuration, but remembered the one fly rule in the regulations. I moved back to the open areas on the west side of the lake and while hand twist retrieving the caddis pupa hooked and landed another small bass and the largest crappie of the day. By 5:50 I’d grown weary of the fishing and hadn’t caught a fish for awhile and quitting time was 6PM, so I retreated to the car. With temperatures in Denver touching the 90’s, snow melt was kicking in. I checked the flows and Bear Creek remained at 27 cfs. In an earlier outing I fished Bear Creek at 22 cfs, so I knew this was probably fishable water. I packed up my gear and lunch and headed out the door at around 11:30. I arrived at the Lair of the Bear parking lot at around 12:15 and was fortunate to get a parking space. I ate my lunch in the car and then put on my waders and rigged my rod. It was quite warm and there were fishermen and picnickers and runners and bikers and dog walkers everywhere. I headed west on the Bear Creek Trail along the stream. It looked a bit high but very clear. I was looking to begin fishing where I’d ended the previous visit to Bear Creek, and when I reached that point, another fisherman was already in the stream so I moved above him by 50 yards or so and entered the water. I initially tied on a Chernobyl ant trailing a beadhead hares ear. This combination wasn’t producing so I clipped off the BHHE and replaced it with a beadhead emerald caddis pupa. As I moved upstream I noticed the occasional golden stonefly fluttering up from the creek, so I removed the Chernobyl ant and replaced it with a Letort hopper. This proved to be a success and I landed two small browns on the Letort hopper after it got submerged in eddies. I also managed a brown on the emerald caddis, but on two or three occasions during this time, I hooked branches too high up to remove the flies without breaking them off. I was doing this when I saw a pause of the fly, and set the hook too hard with no fish attached. After reaching a group of young girls wading into the creek for a refreshing cool off, I walked on the trail around them, and then re-entered. I hadn’t caught any fish for awhile so I returned to the Chernobyl ant trailing a beadhead hares ear and beadhead emerald caddis pupa. In between the Letort hopper and Chernobyl I also tried a small yellow sally with a quill body and a light gray caddis, but these didn’t produce. When I came to a bridge I waded to the other side and began prospecting the water with the three fly combination and landed three small browns, two on the emerald caddis and one on the Chernobyl ant. I also had a couple refusals to the Chernobyl. I attribute the success in this area to being further away from the path and fishing nooks and small pockets along the opposite bank. 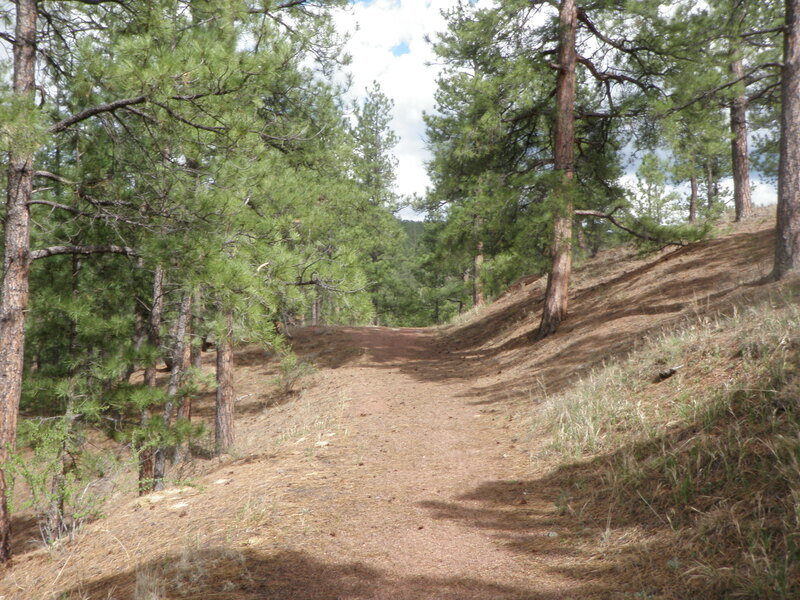 It was now late in the afternoon and I came upon a sign that announced the area was private property, and I was quite warm so I decided to quit for the day and hike back to the car. David Luther called earlier in the week to inform me he’d be in Estes Park for Memorial Day Weekend and asked if I’d like to join him for fishing. I agreed to meet him on Sunday. 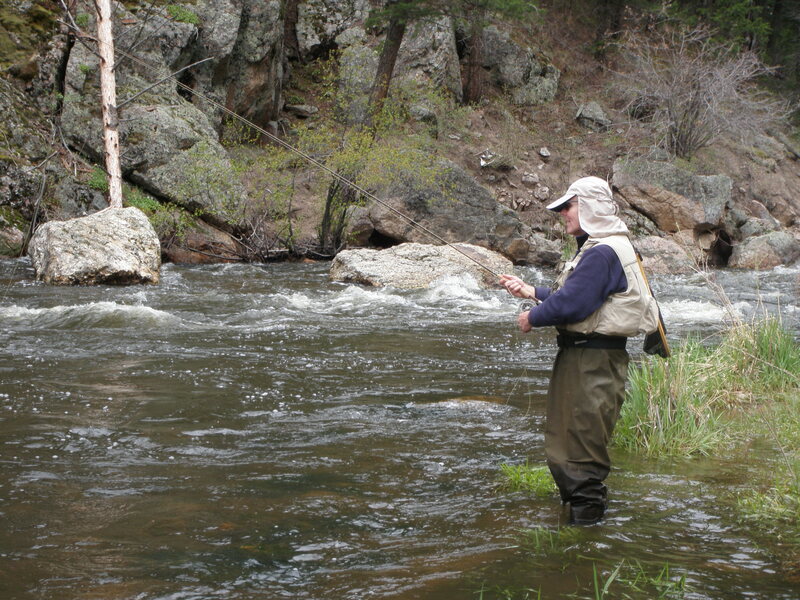 David called me on Saturday from Estes Park after fishing with a guide on Saturday, and we agreed to meet at 9AM at the pullout at mile marker 72 in the Big Thompson Canyon. 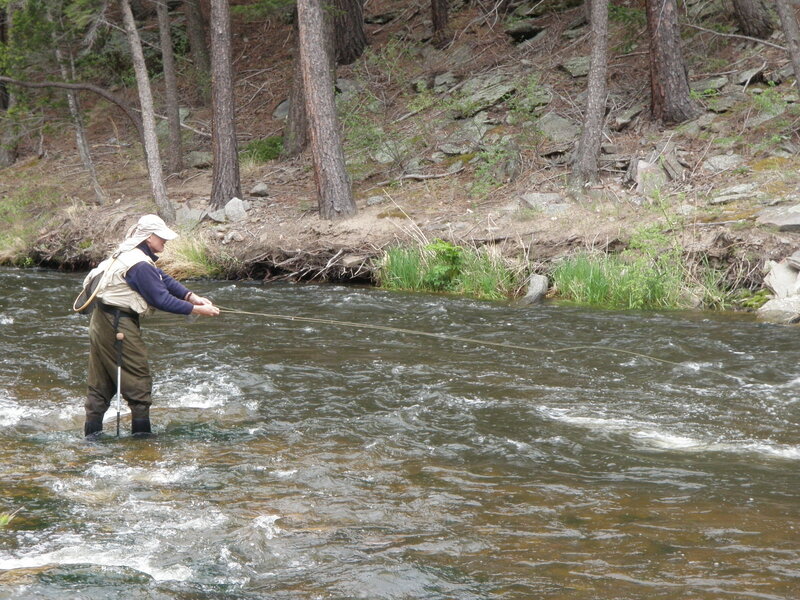 I was a bit skeptical the fishing would be very good, as I noticed the flows were over 300. It was quite cloudy and chilly as I drove to Estes Park and then along the Big Thompson in the canyon below Lake Estes. It would remain mostly cloudy all day with high temperatures probably in the low 60’s at best. I fished comfortably with a fleece and rain coat all day and wore a ski hat in the morning. 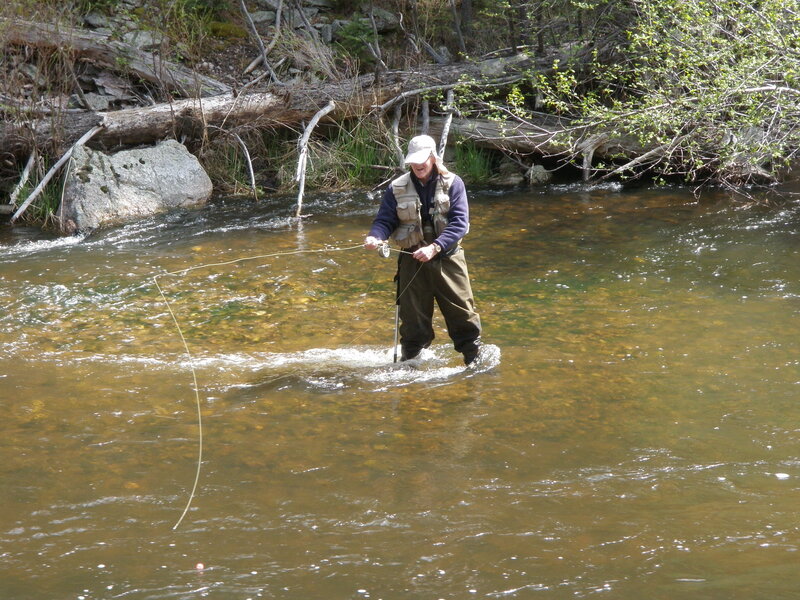 David arrived at around 9AM and I was already dressed in my waders and stringing my sage rod. The river was definitely up, but I was encouraged by the clarity and the number of slow pockets and pools where fish could hold. I walked down the road to the last point before the river raged over a chute and began fishing back toward the car. David L. would begin fishing 50 yards or so above me. I tied on a Chernobyl ant and then added a beadhead hares ear and below that an emerald caddis pupa. It didn’t take long before I’d land a colorful 10 inch rainbow and photographed it. I continued working up mostly in water tight to the bank and landed the occasional fish on the emerald caddis. When I reached David L, he was nymphing with flies he’d purchased at Kirk’s Fly Shop in Estes Park, but not having any luck. I skipped around him and fished closer to the handicapped platform and landed a couple more fish. 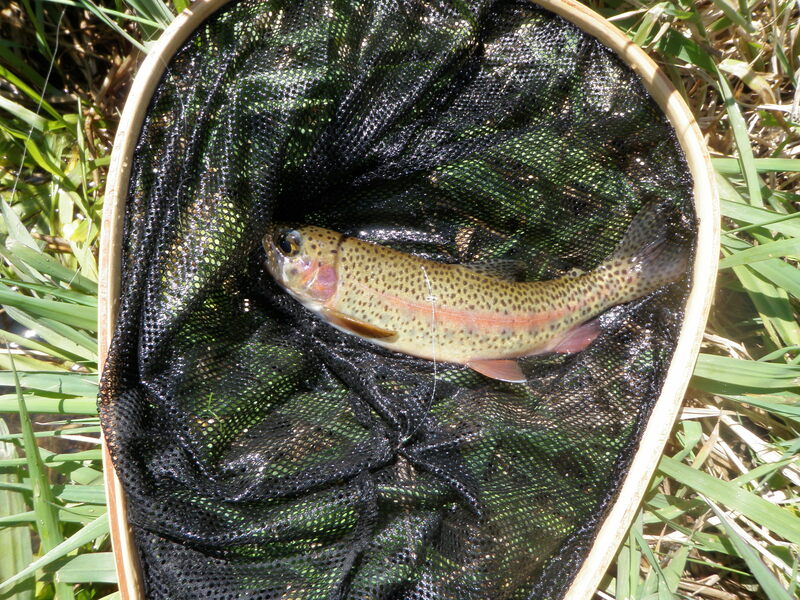 By noon I’d landed 5 trout, 4 rainbows and one brown. I hiked up the bank to go around the handicapped platform and noticed a recently arrived fisherman in the nice water above the parking lot before the 90 degree bend, so I looped back to David to discuss plans. I didn’t want to fish too far ahead of him. We both decided to hike above the lot and fish further upstream. I entered just above the handicapped platform and David was going to fish an attractive run above a large drainage pipe, but then he noticed another fisherman hidden by the trees. As he began walking beyond the fishermen, the other fisherman and a companion decided to quit and left the targeted water for David. I covered the fishable water between me and David L fairly quickly and reached the lower end of the run that he was beginning to cover. At this point we began to notice some blue winged olives skittering on the water and some sporadic rises. I rearranged my flies and moved the emerald caddis to the top and added a beadhead RS2 to the bottom and cast this combination throughout the lower section of the run, but there were no takers. The frequency of rises now increased so I decided to abandon the Chernobyl ant and droppers and go to a single CDC BWO fly. Over the next half hour or so I frantically cast the tiny dry to the 8-10 rising fish, and managed four momentary hookups but didn’t land any of them. David L continued to nymph and then finally added a small Adams parachute and elicited a refusal. Eventually the sun came out, the hatch diminished and the fish stopped rising so we decided to rest the water and return to the car for lunch. After lunch we returned to the run and observed, but the hatch was off. David L. worked his nymphs through the mid-section and tail while I moved upstream and returned to the Chernobyl ant with the emerald caddis and beadhead RS2. I added a rainbow in a nice side slough before David arrived. This fish grabbed the RS2. David began fishing above me but got snagged on a branch along the far bank and managed to maneuver through the heavy flow to dislodge his fly. Since he was close to the bank away from the road, he decided to remain on that side of the river while I fished up along the road. Between 2 and 3 in the afternoon it became partly cloudy and another sparser BWO hatch transpired. During this time I stayed with the RS2 as I didn’t see surface rises and picked up five more trout, four rainbows and one brown. The brown was notable in that it rose and slurped in the Chernobyl ant. One of the fish took the emerald caddis and the remainder went for the RS2. By around 4:30 I was feeling pretty tired so I hiked back down the river to a point across from David L. and watched him work his nymphs. While I watched he caught several fish, so I decided to go deep with my nymphs and work my way back up through the juicier spots I’d already covered. While fishing in this manner I hooked three fish and landed one. I switched out the emerald caddis for a large size 12 beadhead hares ear, and one of the fish I lost broke off at the beadhead hares ear knot. This fish felt a bit heavier than the others. We fished until around 5:30 when we decided to call it a day. David L. followed me in his rental car back to our home in Denver, and he joined us for a wonderful meal. 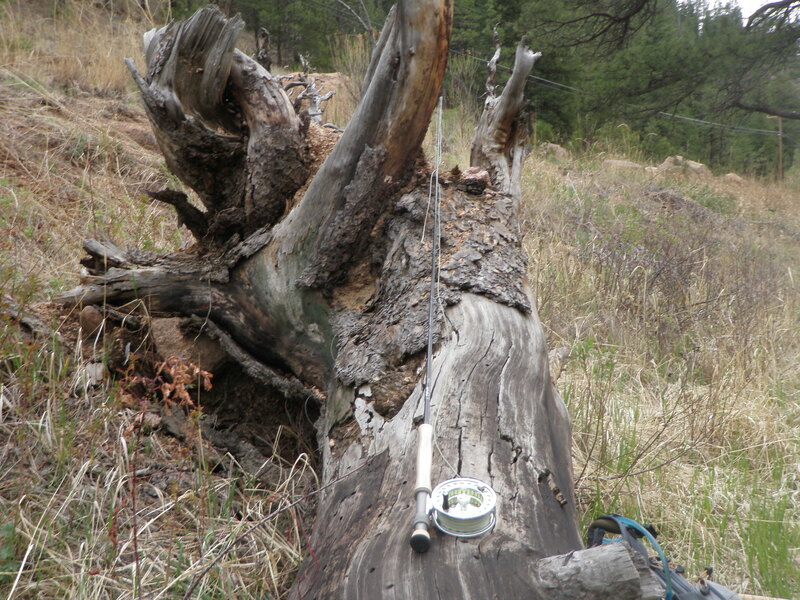 Chalk this outing up to rod testing. Jane and I drove to Royal Gorge Anglers so I could purchase a new fly rod and reel for my Alaska trip on Saturday, and I was dying to give the new rod a try. 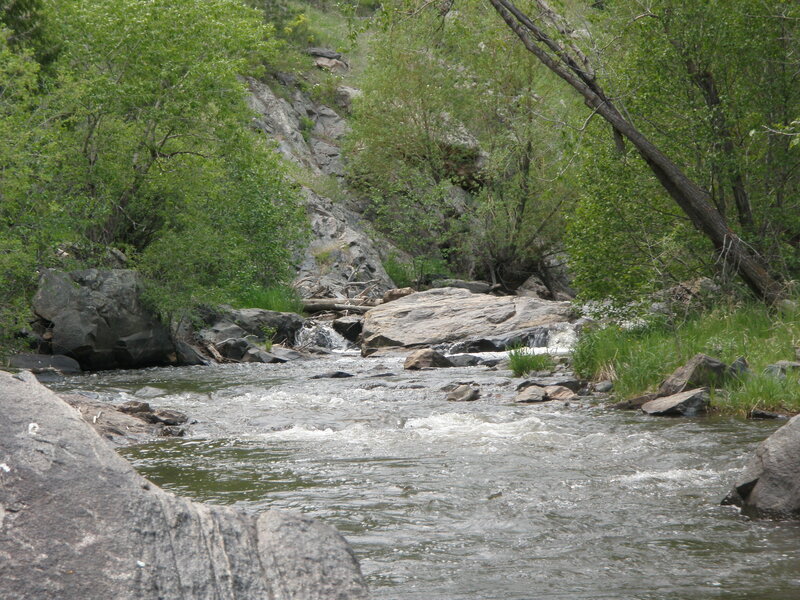 The only stream with reasonable flows after the heavy rains during the week was the South Platte River below Cheesman Reservoir, so off I went. I got off to a late start as the reports indicated caddis were beginning to emerge late afternoon into the evening. I planned to stop at the Jarre Market in Sedalia and purchase a tapered leader, but forgot, so I was banking on having a spare in my front pack for my new fly line. I arrived at the stream at around 1PM and parked at a pullout below Willow Picnic area. I searched through my bag and backpack and then finally found a new leader tucked in my front pack. I made a loop to loop connection with the tip of the new line and attached the Orvis reel to my new rod and prepared to fish. I wore my raincoat as a windbreaker. It was a cool day with partly cloudy skies and a fair amount of wind. I strung my new rod and walked down the road and cut over to the river approximately where I’d stopped fishing on my last trip to the South Platte. 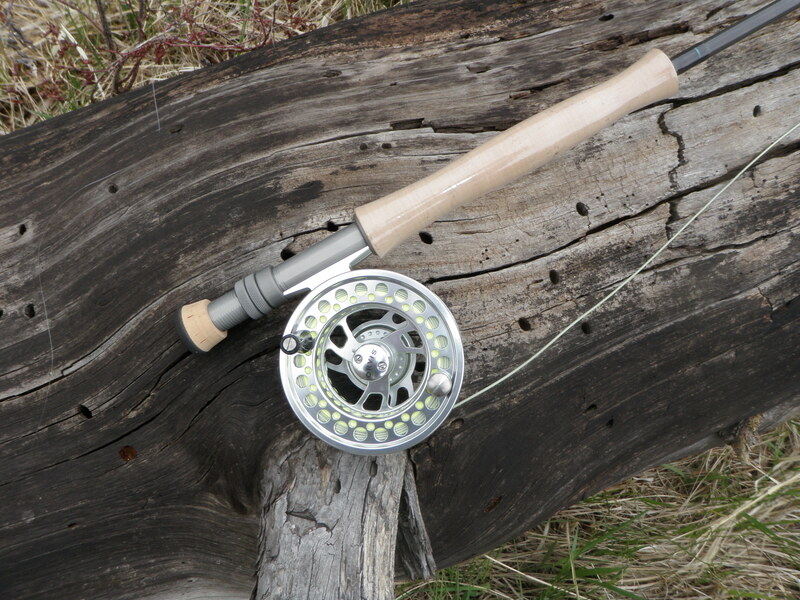 I propped the rod on a large stump and took some photos of the reel, the rod and the model and line size on the rod. 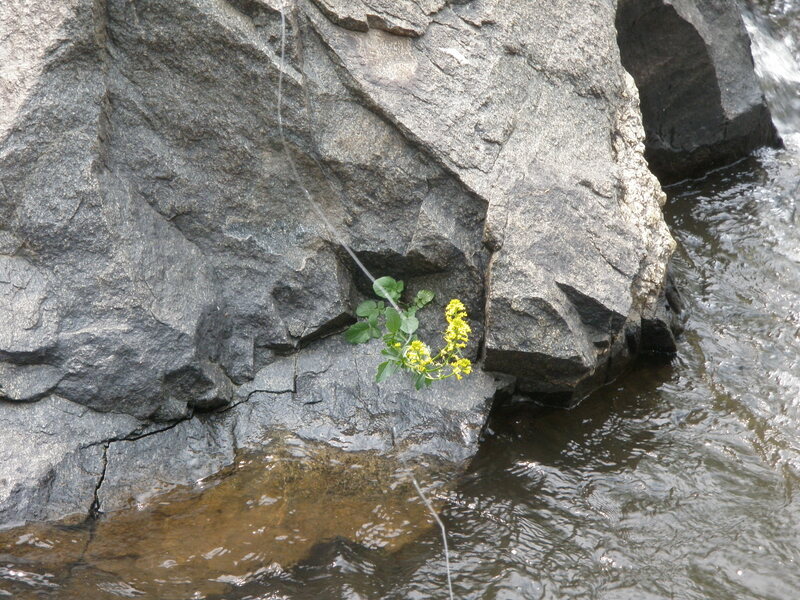 I began fishing with a yellow Letort hopper and trailed a beadhead hares ear and began prospecting the likely spots. The flows were up since my last trip, and I noticed a considerable amount of aquatic moss floating in the river. In fact it was so dense that I had to remove moss from my flies nearly every third or fourth cast. After I’d covered a considerable amount of water, I reached a small island below Willow. Some geese went up the right channel so I retreated back to the bottom of the island to fish up the large and faster left side. Here I spotted a rise and switched to a caddis and experienced a split second hook up with the small fish that had risen. This would prove to be the extent of my action on the new rod. I switched over to a strike indicator and nymphs and fished the nice deep run below the island to no avail. The larger but light stiff Scott rod handled the heavier nymphing rig easily. I decided to drive further up the river to the catch and release area as I wasn’t seeing much evidence of fish where I was fishing. I drove 5-10 miles to the oxbow area before Trumbull and hiked back the trail to the tip of the oxbow. I continued working the nymphs including a RS2 as the bottom fly. 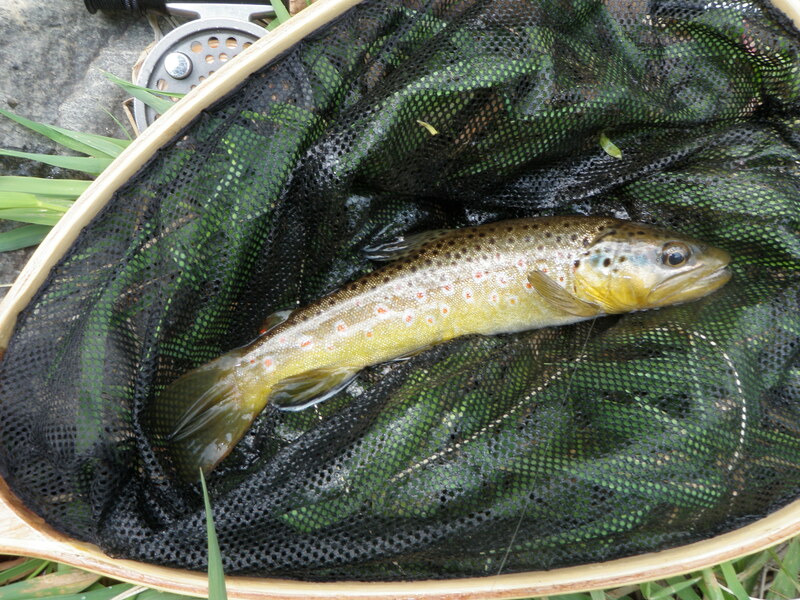 The sky clouded up and a brief shower occurred but much to my chagrin this did not provoke any BWO or caddis activity. I worked my way around the oxbow fishing the likely runs and seams but I wasn’t rewarded for my persistence. After the brief shower passed and the sun came out I decided I’d had enough and returned to Denver. The rod was a success from a casting standpoint, but remains unproven for fish catching ability.